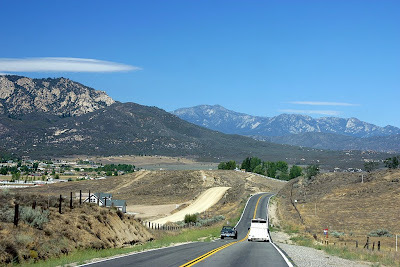 It's always surprised me to know that there are mountains, not hills but honest-to-gooness montains, just east of the flat, hot, highly populated areas in Southern California. I've heard of Big Bear, where you can go skiing within an hours drive of where people are basking in the sun at the beach, but I've never been there. Well ... it's true! 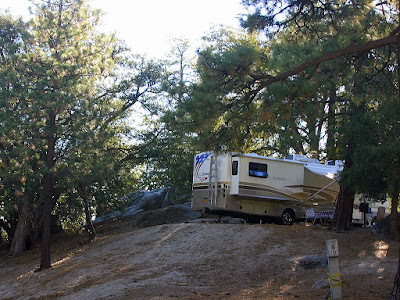 We traveled to the Thousand Trails park called Idyllwild. 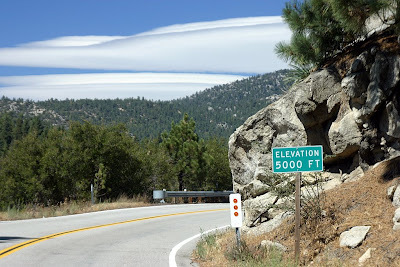 It's at 6600 feet. What a pretty drive! I think this can honestly be called a 'Campground'. Lots of pine trees, big sites, nature trails, and cool air. We woke up to 56 degrees! In fact, I'd say that a lot of these sites were better used by tents! You had to be pretty adept at handling your rig to get parked on these hills! 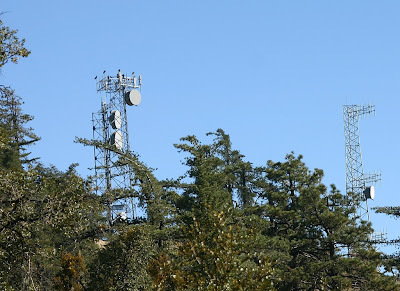 With all these trees, we were a little worried about getting our satellite Internet. As it turned out, we got on thru the trees just fine. We also had the best cell signal that we've had in the last month! Go figure - our most remote location all month and the best signal. Perhaps this sight at the entrance to the park would explain it. see more photos on our web album.